Watching the World Cup is just like watching a master class in endgames! 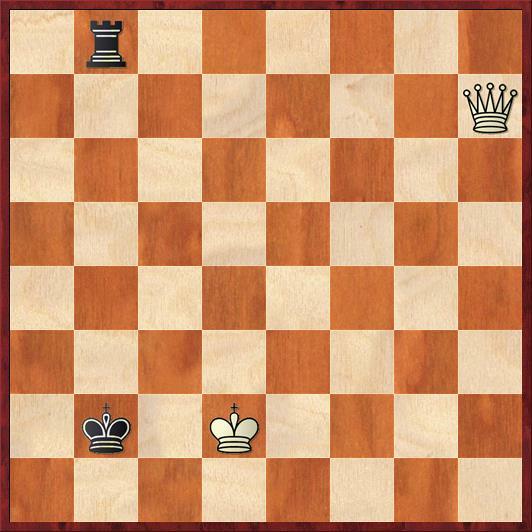 We’ve already had three matches decided by very difficult K+R versus K+B endgames, with equal pawns on both sides. Today, in the semifinal round, the masters decided to teach us a class in the infamous K+Q vs. K+R endgame, with no pawns on the board. To set the stage: The semifinal matches were Wesley So vs. Deng Liren and Levon Aronian vs. Maxime Vachier-Lagrave. In some ways this is the most important round of the whole tournament, because the two winners automatically qualify for the next Candidates’ tournament. I think that, for most players, the chance to become world champion is more important than any money prize. Position after 61. Kh2. Black to move. White is basically in a zugzwang position and has to make a concession. If 62. Kg1 Kg3 63. Kf1 Qd3+ will decide shortly, as White either has to walk into a pin or an X-ray check, and either way he loses the rook. Also, 62. Rg2 is extremely bad, as 62. … Qe5+! 63. Kg1 Kh3 is just death. Black threatens checkmate on e1, and if 64. Kf1 Qa1+ we will once again get an X-ray check on the second rank. And that brings me to my theme for today, which I call the Seesaw. Position after 62. Ra2. Black to move. Back when I was learning chess, we all learned endgames from Reuben Fine, or we learned them from people who learned from Reuben Fine. And the official judgment on such positions was that one of two things will happen. Either White has to retreat (like with 62. Kg1 or 62. Rg2) or he’ll have to let the king and rook get separated. If he does that, then Black just plays check-check-check and forks them. Piece of cake! But then computers came along, and we discovered that it’s not so simple! 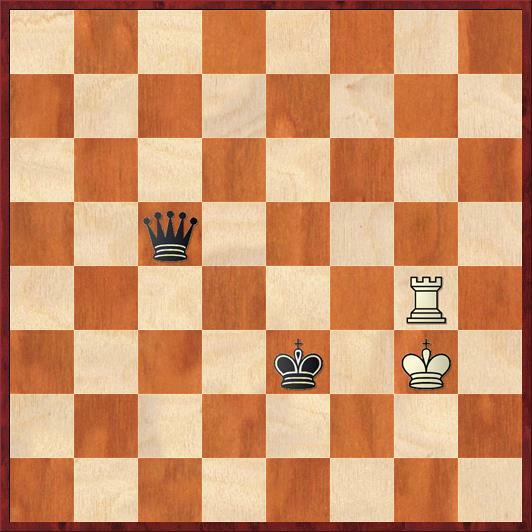 In fact, if you play this endgame against a computer, it will cheerfully separate the king and rook. 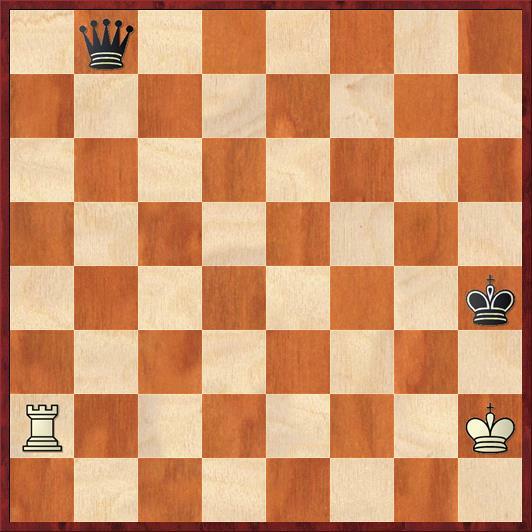 It can work out exactly when it’s safe to do so, and you’ll be left scratching your head: If I can’t force the king and rook to retreat, then how am I going to make progress? 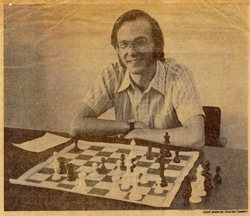 I remember that back in the 1980s, GM Walter Browne once played against a computer in this endgame, and he was not able to win within the 50-move rule. Basically, our Reuben Fine-era training is deficient. There’s something that Reuben Fine didn’t teach us, and it’s the Seesaw. Same idea. Keeping an eye on both forking squares, c4 and d5. 67. Kg2 would be met by 67. … Qb7+, transposing to the game. Finally going to a white square. 68. Kh2 would be met by 68. … Qb8+, transposing to the game. This was the goal of Black’s strategy. If the king goes to the first rank, then 70. … Qb1+ forks king and rook. If White’s king goes to the g-file, then 70. … Qg8+ forks king and rook. Note, by the way, that if Black’s king were on g4 this last bit would not work, because the king would be in the way. Now you can appreciate how clever Liren’s move 61. … Kh4 was! Note the path of Black’s queen: e5-d4-d6-c5-c7-b6-b8. While White’s king oscillates between g1 and h2, the Black queen gradually “seesaws” back to its target square, b8. It is critical to understand this seesaw strategy, because this is how you make progress when the king and rook are separated. The key is always to realize that the weaker side’s king cannot move to squares on the same color of the rook. Amazingly enough, a couple hours later we saw almost the identical position! Position after 73. Qd4. Black to move. Recognize this position? If you switched the colors and rotated the board 90 degrees counterclockwise, it would be the exact same position as in the game So-Ding! However, the one relevant difference is that it’s Black to move, not White. If it were White’s move, he could play 73. Kd1 and transpose exactly to So-Ding. And now we see why Vachier’s defense was inferior to So’s. Now Black’s king has to avoid the white squares, but there are no black squares he can move to. So he played 75. … Ka7 76. Qe6+ Rb3 77. Kc2 (winning the rook) Ka1 78. Qa6+ (no, I won’t take your rook, I’ll just checkmate you instead) Black resigns. Position after 80. … Kb2 (analysis). 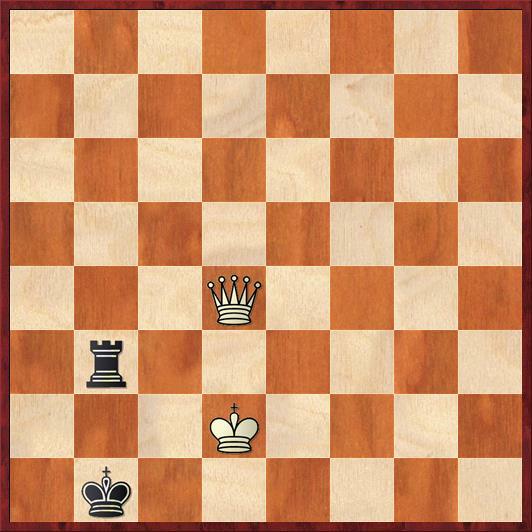 White to move. 81. Qc2+! Ka1 82. Kc1 Rb3! It seems as if Black is making progress, but it’s an illusion. 84. … Kb2 would be met by a deadly pin, 85. Qd4. 85. Kc2 Rb2+ 86. Kc1 Rc2+ 87. Kxc2 … There are no more tricks, and Black can resign. At least this would have been a better way for Black to lose than the game. Here’s one more example, made-up this time, to show how the seesaw technique can be used in an earlier stage of this endgame. Study position. Black to move. This is exactly the sort of position I struggle to beat the computer in, because Fine never told us what to do. Any human here would play 1. … Qe3+?, but it’s the wrong move. According to the tablebases, the above position is mate in 20, but by playing 1. … Qe3+ you’ve turned it into mate in 25! In other words, you’ve cost yourself five moves with one blunder! In fact, after 1. … Qe3+? 2. Kg4 the tablebases say that Black’s best move is 2. … Qe5, and after 3. Kf3 you haven’t gotten anywhere at all. The computer says that Black’s correct move is 1. … Qg5! This introduces a new theme, which I’ll call the back-against-the-wall maneuver. When you have the king opposition, put your queen behind the opponent’s king. This puts his “back against the wall” — the king has nowhere to go to, and so White has to move his rook. On the natural human move 2. Rg4, now we can play 2. … Qe3+ and we’ve made progress. The king has to stay in the “coffin corner” with 3. Kg2. But suppose instead that White plays computer style with 2. Ra4! Now you can initiate the seesaw: 2. … Qd5+ 3. Kf2 Qc5+ 4. Kg3. As usual, White’s king has to stay on squares that are the opposite color from his rook. Now it’s time for Black to call a halt to the seesaw. We’re never going to be able to fork the king and rook, so instead we have to close in with our king. Notice also the important point that our queen at c5 controls White’s checking square. So we can play 4. … Ke3, and we have made progress. That’s what this endgame is all about — making incremental progress. Now, if White is smart, he’ll play 5. Rg4, and guess what? We’ve moved everything over a file. Position after 5. Rg4. Black to move. I’ll bet you can figure out Black’s next move! Once again, we play the back-against-the-wall maneuver followed by the seesaw. By the way, I’m not copying from the Nalimov tablebase. The tablebase says that this is not Black’s fastest way to win. But I’m not interested in that: I’m interested in learning patterns that will enable a human to win. Humans aren’t tablebases; we can’t memorize a million variations. Instead, we have to learn two or three themes that will allow us to accomplish the same goal. 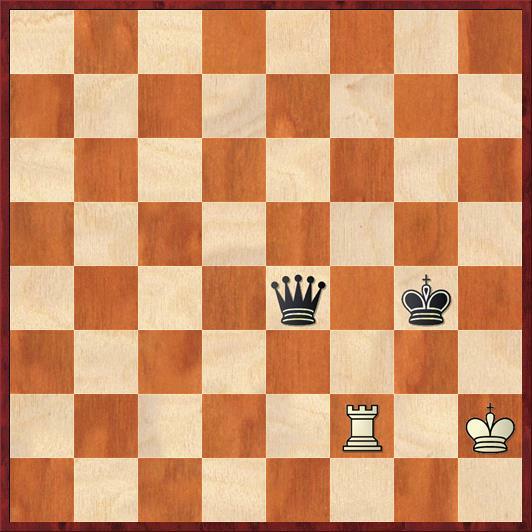 Now, as usual, White has the option: retreat or separate the king and rook. 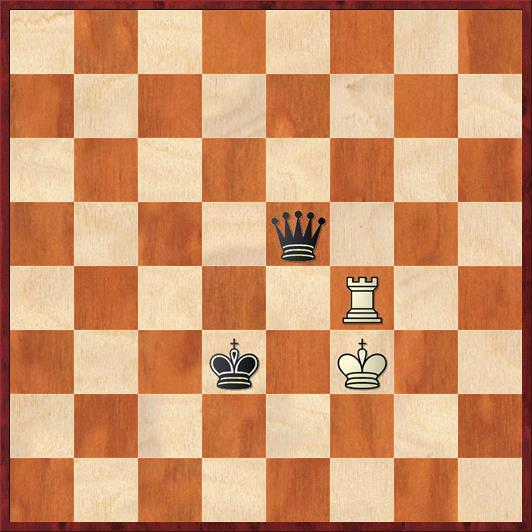 In keeping with our theme, let’s see what happens if he separates the king and rook. Now, with the king and rook separated, we play the seesaw. 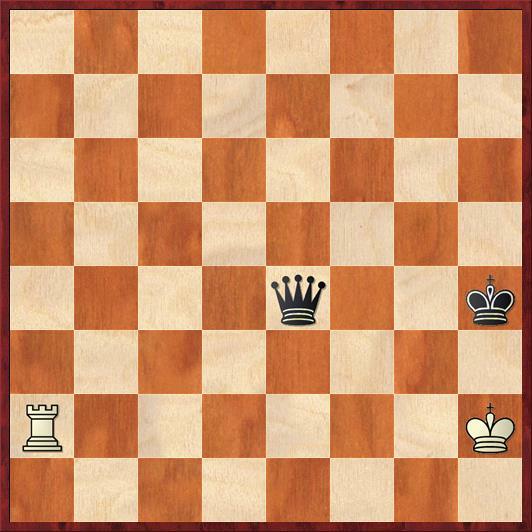 As usual, we aim for a position where White’s king cannot move to a light square. I’ll show you the more “thematic” line first, where White avoids the light squares. Now he can’t go to a light square. 8. Kg3 Qd6+ 9. Kh4 Kf3! and Black forks the king and rook next move. Backing up, if White had played 7. Kg4, trying to take advantage of his one opportunity to run onto a light square, we could play the following slightly modified seesaw: 7. … Qe6+ 8. Kg5 (on any other move we would play a normal seesaw; this move is the only one that forces us to vary our plan) Qe7+ 9. Kh6 Qe6+! Surprise! Checking on a light square is allowed, too. Now White’s king has to sadly retrace his steps, because moving to the seventh rank would allow … Qd7+. Again, the king must go back, and he has only one option. and we have transposed into the position after move 8 of the main line. I have to admit, this endgame ain’t easy. There is no way to make it easy. Nevertheless, I hope that this post gives you some ideas on how to make progress against the “computer-style” defenses for the weaker side. Two ideas, to be precise: the seesaw maneuver and the back-against-the-wall maneuver. As for the World Cup, we are now down to Ding Liren vs. Levon Aronian. Interestingly, even though Aronian is rated higher, Liren has a huge positive score against him, with 3 wins and 3 draws in six “classical” games. Aronian’s fighting spirit is huge, but I was really impressed by Ding’s play against So, and I am going to pick him to win the World Cup. Quite instructive Mr Mackenzie! I remember reading Axel Smith’s ‘Pump up your rating’ where he briefly explains the third rank defense as the toughest of all to fight for the draw. Nevertheless I feel that in a practical game the attacking side has great chances to achieve victory, just as you exposed in this article. I love this ending so much. Dana do you know the correct maneuver in this key position from the third rank defense? Re: the Walter Browne challenge. Soltis described this episode in detail in his column in the June 2017 issue of Chess Life. In short, Browne failed to win with a Q vs Belle’s R within 50 moves, but succeeded in a rematch, winning the $100 bet! Hey Mr Mackenzie! This Seesaw maneuver allowed me to solve a beautiful chess problem published on Mark Dvoretsky’s ‘Maneuvering. The Art of Piece Play’ and at the same time led me to ‘discover’ the Stairway maneuver. Whether you have a minute you could check it out at http://www.captainchess.com/the-seesaw-and-the-stairway-maneuver/ Thank you very much! What an elegant study by Dvoretsky! I’m glad that my post helped.